3. What is the purpose of the network command used in the configuration of the RIP routing protocol? It specifies RIP v2 as the routing protocol. It enables the use of VLSM. It specifies the fastest path to the destination route. It specifies which interfaces will exchange RIP routing updates. It activates RIP for all routes that exist within the enterprise network. 4. Which of the following is considered a limitation of RIP v1? 5. Which command would a network administrator use to determine if the routers in an enterprise have learned about a newly added network? Both RIP versions use hop count. Both RIP versions can provide authentication of update sources. Both RIP versions use 16 hops as a metric for infinite distance. RIP v1 uses split horizon to prevent routing loops while RIP v2 does not. RIP v1 uses hold-down times to prevent routing loops while RIP v2 does not. RIP v1 broadcasts routing table updates, while RIP v2 multicasts its updates. 8. What does VLSM allow a network administrator to do? The network shown in the diagram is having problems routing traffic. It is suspected that the problem is with the addressing scheme. What is the problem with the addressing used in the topology? 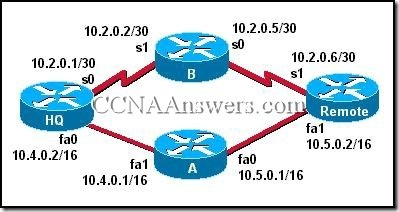 The address assigned to the Ethernet0 interface of Router1 is a broadcast address for that subnetwork. The subnetwork configured on the serial link between Router1 and Router2 overlaps with the subnetwork assigned to Ethernet0 of Router3. The subnetwork assigned to the Serial0 interface of Router1 is on a different subnetwork from the address for Serial0 of Router2. 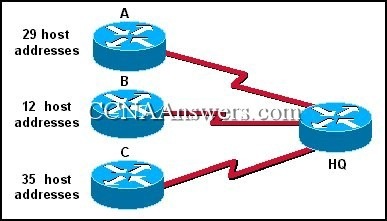 The subnetwork assigned to Ethernet0 of Router2 overlaps with the subnetwork assigned to Ethernet0 of Router3. Refer to the network shown. How will Router1 summarize and advertise the four networks attached to its Ethernet ports? A Class C address has been assigned for use in the network shown in the graphic. Using VLSM, which bit mask should be used to provide for the number of host addresses required on Router A, while wasting the fewest addresses? The routers in the diagram use the subnet assignments shown. What is the most efficient route summary that can be configured on Router3 to advertise the internal networks to the cloud? Select the routing protocol to be configured. Assign an IP address and subnet mask to the interface. Update the ip host configuration information with the device name and new interface IP address. Configure the routing protocol with the new network IP address. Configure the routing protocol with the new interface IP address and subnet mask. Configure the routing protocol in use on all other enterprise routers with the new network information. 14. What is the default network mask for a Class B address? 15. How often does RIP v1 send routing table updates, by default? An additional subnet is required for a new Ethernet link between Router1 and Router2 as shown in the diagram. Which of the following subnet addresses can be configured in this network to provide a maximum of 14 useable addresses for this link while wasting the fewest addresses? 17. Which subnet mask is represented by the /21 notation? 18. Which of the following problems does VLSM help to alleviate? In the network shown in the graphic, three bits were borrowed from the host portion of a Class C address. How many valid host addresses will be unused on the three point-to-point links combined if VLSM is not used? 20. A Class C network address has been subnetted into eight subnetworks. Using VLSM, the last subnet will be divided into eight smaller subnetworks. What bit mask must be used to create eight smaller subnetworks, each having two usable host addresses?